Thematic maps use different themese among places. The first widespread use of thematic maps were developed in France in the mid 1700's. Themes for each map can differ for each geographical location. It can be anything from social, economical, or physical qualities. The theme of this map is related to political parties in the United States. 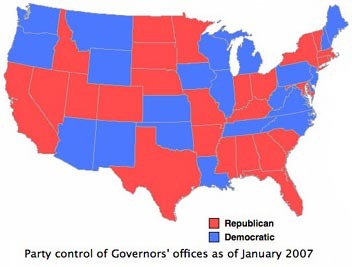 This shows each state in the continental United States and which party the state is affiliated with during the Governors' Office in January 2007. Florida, New York, and California all have Republican Governors. On the other hand, Louisiana, Washington, and Pennsylvania all had Democratic Governors.